The Beatles attracted hoards of fans wherever they went, so the entourage had to keep moving on to new locations, leading to a frenetic shooting schedule. Paul McCartney had originally asked Don McCullin to shoot that day, but five other photographers also showed up, including Mal Evans and Tom Murray, whose photographs are seen here. Rounding out the party was Yoko Ono, Francie Schwartz, and Gary Evans, Mal’s six-year-old son. The first location was Thomson House, home of the “Times” newspaper, where Lord Snowden had built a photographic studio. 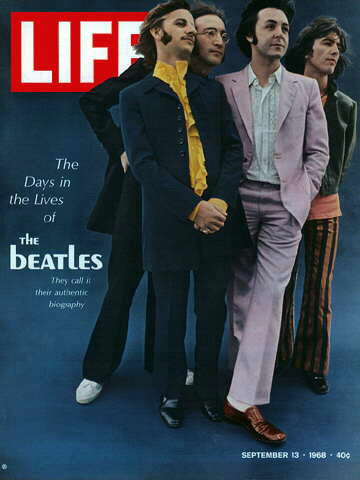 McCullin took some shots of the band against a blue background—one of these shots was later used on the September 13, 1968, cover of “Life” (at right). After Thomson House (it has since been demolished), the band headed to the Mercury Theatre in Notting Hill, where, bizarrely, they posed with a real parrot. According to McCullin, the light in the old theatre was terrible, which probably explains the lack of photographs from that location. The Beatles then drove over to Highgate Cemetery for some quick poses outside, and then on to Old Street, where they climbed onto the roundabout in the middle of the busy thoroughfare and posed on a large concrete block (below). 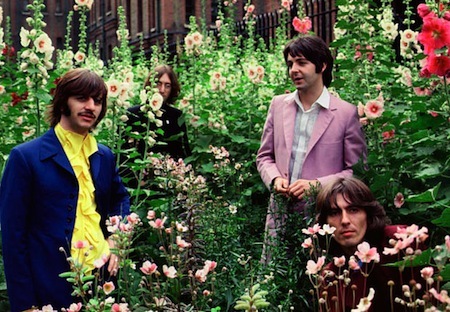 Presumably fans were quick to spot the Beatles since this is a busy section of London, so they moved on to St. Pancras Old Church and Gardens, where shots were taken of the Beatles larking around with the water fountain and in a flowerbed of tall hollyhocks (see photo at bottom). This was also where the Beatles were snapped next to a man asleep on the bench—apparently he never woke up—and where McCullin got the shot for the gatefold sleeve of the “Red” and “Blue” compilation albums of 1973. The most bizarre photograph of the day was taken at the next location, Wapping Pier (top photo), where John Lennon suddenly dropped to the ground and played dead (below, right). The other three Beatles crouched over him, making an eerily, prophetic picture. The final location for the day was Paul McCartney’s house at 7 Cavendish Avenue, St. John’s Wood, where the band was photographed in a glass dome that McCartney had constructed in his garden. 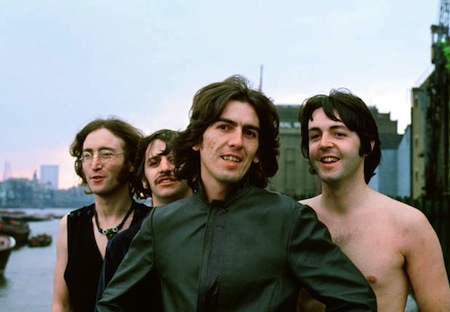 The “Mad Day Out” photo session appears to be all fun and frolics, but considered against the background of the Beatles’ lives and careers at the time, some of the images take on a whole new meaning. The band was in the middle of recording “The White Album” at Abbey Road Studios, a recording notoriously fraught with tension and dissent. They were also launching their new corporation, Apple Corps, which was a great source of stress for all concerned. Previous recording sessions had been off-limits to outsiders, but “The White Album” sessions saw the attendance and influence of Yoko Ono, as well as the presence of McCartney’s girlfriend at the time, Francie Schwartz. The sessions became unfocused, with different band members recording in different studios. 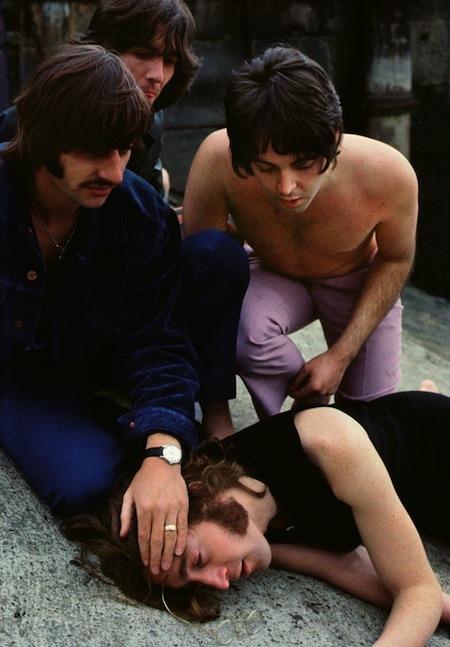 The tension culminated in Ringo Starr leaving the band on August 22nd, returning two weeks later after pleas from the others. Against this tension in the studio, the Mad Day photographs become even more poignant. 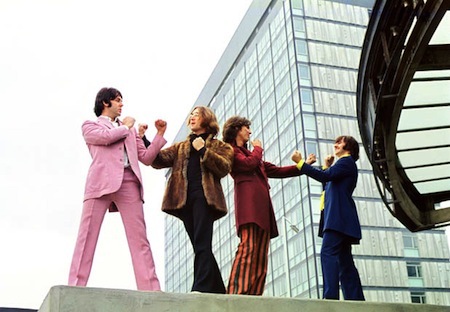 The Beatles appear happy, yet shots like Tom Murray’s “Things To Come,” with the Beatles squaring up to each other at Old Street (third photo above), perhaps reveal some hidden tensions. But the images shot that day are some of my favorites of the band—dressed in flamboyant Summer Of Love garb, they were taken during my favorite period of the Beatles’ music. Tom Murray’s rare color photographs of the Mad Day are a privileged look at this incomparable band. Very cool, havent seen these before! Is it me or do they look a little “jaded”! Beautifull pictures i have bought 4 up to now great investments but dont intend to sell they look beautifull up on walls .Thanks tom.